Chiari Malformation is a disorder in which certain structures in the brain fail to develop normally. The condition is considered to be a congenital malformation, meaning the patient is born with the disorder. However, in some instances patients have acquired the disorder. In Chiari malformation, the brainstem , the cerebellum , and the upper cervical region of the spine are all affected. The brainstem is a stalk-like structure connecting the spinal cord to the forebrain (the front and largest part of the brain). The cerebellum is a walnut-shaped structure located near the base of the brain. The upper cervical region of the spine is the area under the posterior skull. When these structures fail to develop normally, certain anatomical abnormalities occur: (1) a pit or hollow forms at the back of skull (called a posterior fossa ), (2) the pathways through which the cerebrospinal fluid (CSF) flows are reduced in size or may be blocked, and (3) the cerebellar tonsilsprotrude (or herniate ) through the bottom of the skull (called the foramen magnum ) into the upper spinal canal. The cerebellar tonsils are two finger-like appendages of the brain at the base of the cerebellum. The foramen magnum is a large hole at the base of skull that creates a passageway for the spinal cord. Chiari Malformations were first described in the 1890’s by Professor Hans Chiari, a German pathologist. Professor Chiari categorized these abnormalities in order of severity: Types I, II, III, and IV. Children with the birth defects spina bifida (i.e. the rear boney structures of the spine did not close completely prior to birth) or myelomeningocele ( spine and spinal canal did not close) are usually found to have Chiari Type II Malformation. Chiari Types III and IV involve serious herniation of the cerebellum and are the most severe and rare. Most people with Chiari Type I Malformation are symptom free, while those with Types II, III or Ivwill exhibit symptoms. Sometimes symptoms develop during childhood or early adulthood. Symptoms develop when pressure is created in the upper cervical spinal canal by the abnormal placement of the cerebellar tonsils. This can obstruct the flow of CSF. While headache and neck pain are the most common symptoms, other symptoms include dizziness (vertigo), lack of coordination and unsteadiness, slurred speech, drooling, gagging, difficulty swallowing, fainting with a cough, numbness, and loss of bowel or bladder control. Some patients have reported “fullness” in the ears, hearing difficulties, ringing in the ears (tinnitus), and visual disturbances. What is the connection between Chiari Malformation and Syringomyelia? Chiari Type I Malformation is associated with other disorders such as Syringomyelia (SM). SM is a disorder that develops when CSF enters the spinal cord and forms a cavity called a syrinx . A syrinx is any abnormal widening of the spinal cord canal that creates a cavity; it can be called a cyst, hydromyelia, or syringomyelia. As CSF accumulates in the cavity, abnormal pressure compresses the spinal cord and may interrupt or block the normal flow of CSF. The spinal cord is the primary communication system between the brain and the extremities. 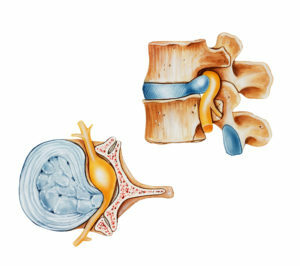 When spinal cord compression occurs and/or the flow of CSF is disrupted, different symptoms may develop. The symptoms may include pain, weakness, numbness, and stiffness that affect the back, shoulders, arms or legs. Other symptoms include headache, inability to feel temperature changes, sweating, sexual dysfunction, and loss of bowel and bladder control. The diagnostic process involves taking the patient’s medical history, physical and neurological examination, and specific test studies to reveal the abnormality and degree of damage. Electrodiagnostic Studies include: Somasensory Evoke Response or Potential (SER, SSEP), Brain Stem Auditory Evoked Response (BAER), and Electromyography (EMG). These tests determine if the spinal cord (SER, SSEP) and brain stem (BAER) is working normally. An EMG reveals details about the function of the spinal cord and sensory and motor nerves. If Chiari Malformation or Syringomyelia is not causing symptoms, no treatment is recommended. Surgical treatment is recommended to relieve and stop the progression of symptoms. The goal of surgery is to relieve pressure on the brain stem, cerebellum, and spinal cord. One type of surgical procedure is called a Sub-Occipital Decompression. The sub-occipital area is located under the skull near the first cervical vertebra. This surgical procedure enlarges the hollow ( posterior fossa ) at the back of the skull. Surgery is performed to unblock and restore normal circulation of CSF. Sometimes the sub-occipital decompression procedure (or a similar procedure) is accompanied by surgically implanting a shunt. A shunt is a tube that is used to by-pass a blockage and to restore normal CSF flow. Chiari Malformation and Syringomyelia are complex neurological disorders. Symptoms may become worse over time. Good outcomes are possible if treatment is not delayed. There is always the risk that symptoms may return following surgery. In some cases, another surgical procedure may become necessary.